A family syndicate from Dublin has come forward to claim Tuesday's EuroMillions jackpot, worth more than 175m euros (£152m). It is the biggest jackpot claimed by an Irish ticket holder in its history. The syndicate is from Naul in north County Dublin, close to the border with County Meath. A spokesperson for the winners, who is married to one of the syndicate members, said the family is "very close". "This is unbelievable - it will take us some time to get our heads around this win and to organise ourselves," he said. "This is a dream come true. "We don't want this to change our lives. "What is so exciting is that we will be able to share this money with children, grandchildren and extended family members." One of the syndicate members realised their good fortune when she checked the winning ticket after Tuesday night's draw. She said: "I heard on the RTÉ news that there was a win in Ireland and I caught the last three numbers. "I checked the rest of the numbers online. "I was numb! It took a bit of convincing everybody that we had won." The family member put the winning ticket in an Argos catalogue and put it under her mattress for safe keeping. "I didn't sleep a wink all night," she added. On Wednesday, the family deposited the winning ticket for safe keeping with the National Lottery and arrangements are now being made for the prize claim to be paid out in the next few weeks. The ticket was bought at Reilly's Daybreak in Naul. Les Reilly, the owner of the shop, said he dropped the phone after finding out he had sold the winning ticket. "I actually got a sick stomach and my legs started to shake. "I don't know how the people felt who won it but I was in total shock, just total shock," he told BBC News NI. Mr Reilly said the win had whipped up excitement in Naul. "I've never seen a buzz or anything like this. "The whole village - a small village in a rural county - it's just buzzing, it's just amazing," he said. National Lottery spokeswoman Miriam Donohoe told the BBC the win "will be a huge shock to the ticket holder". She said it was the 14th EuroMillions win in Ireland. The previous biggest Irish winner was Dolores McNamara from Limerick, who won €115m (£100m) in 2005. Dermot Griffin, the CEO of the National Lottery, said that it has been "an incredibly lucky period for players on the island of Ireland". In January a couple from Northern Ireland won a EuroMillions £115m jackpot. Frances and Patrick Connolly, who live in Moira, County Down, matched the winning numbers in the New Year's Day draw. 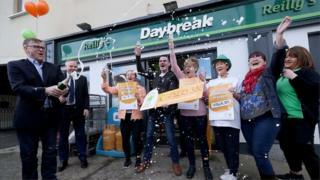 It was the fourth biggest UK EuroMillions win and the biggest in Northern Ireland. The jackpot has been rolling over since the start of January this year, and will see the winner pick up a cheque for €175,475,380.